Wednesday’s new resolutions marked a total of seven bills in the past three weeks focused on student safety and wellness. They included a bill that would create a commission on mental health and another to increase protection related to on-campus political demonstrations. When Café 3 opened its doors last week, Cal Dining unveiled a new menu and food station designed to accommodate Kosher, halal and vegetarian diets. Through food, the campus and Cal Dining hope to satisfy the campus’s hunger for inclusivity and sustainability. After months of deliberation, the UC Board of Regents released a report of its revised statement of Principles Against Intolerance on Tuesday, which now expressly condemns anti-Semitism and anti-Zionism. 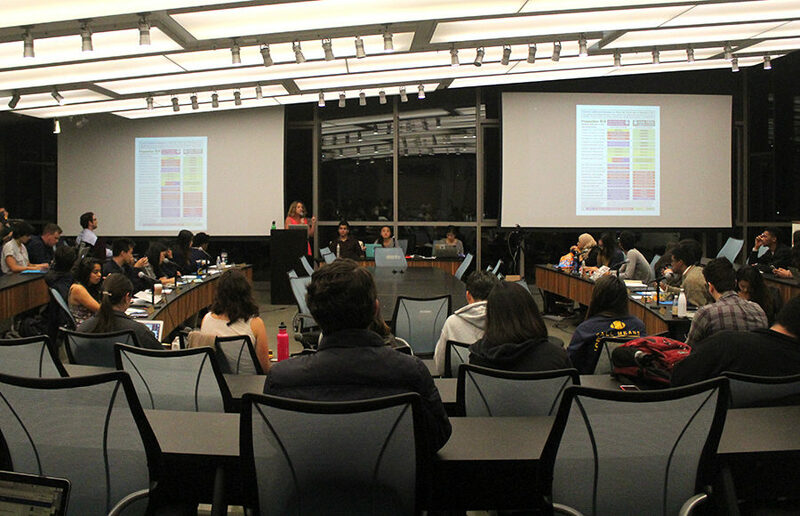 The ASUC senate amended and passed “A Bill Condemning Anti-Semitism” to include clauses concerning the creation of a senate ad hoc committee on the subject at a meeting Wednesday night. An Israel Defense Forces combat veteran delivered a controversial public address on campus Tuesday evening calling for the reform of Israeli-Palestinian relations and an end to the Israeli occupation of disputed territories in the West Bank and Gaza Strip.